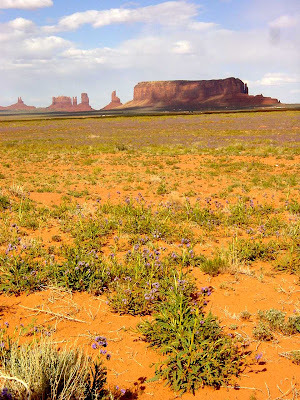 I knew the moment I called Four Corners in NM, CO, AZ and UT an overrated place that my dad would comment about a geeky young kid who was utterly fascinated with the spot when we visited in my 10th year or so (I loved maps), and my mom would start searching through the photo archives. The case is not ironclad, because this is my brother, not me. If I had to testify under oath, I would have to say that yes, I was there, and I was really excited about covering parts of four states with my foot (yep, I have big feet). A picture may even exist. One of life's little coincidences is that my brother is a chemistry professor in one of those states today, after growing up in California. I know people are waiting for the other half of my "overrated places" list, but I am on the road with limited web access the next few days. I will try to get it posted soon: sacred cows must be sacrificed! I am about to kick a hornet's nest, more or less just for the fun of it. There are so many places to see in the world, and lots of lists and books that describe them, and I am doing all I can to see as many as I can. But some places, to be perfectly honest, felt a bit like a waste of valuable time, especially when some incredible geology was nearby, being missed. These are the 10 OVERRATED PLACES TO SEE BEFORE YOU DIE!!!! 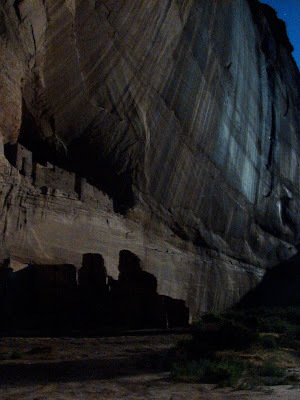 In one sense I REALLY hesitate doing something like this because some perfectly innocent and good people are eking out a living selling trinkets and souvenirs at these places, so, do consider this in poorer regions (I'm thinking of the Navajo Nation, for instance). I got the idea from a book on 101 places NOT to see, but I'm trying to be a bit more nuanced! There are some great alternatives near by! 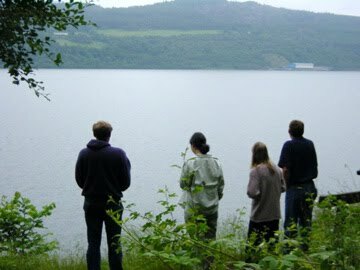 The thing is, this is what we did at Loch Ness (above). On the other hand, just a few miles down the road at Loch Lochy the cliffs were higher, more spectacular, and Ben Nevis, the highest point on the British Isles loomed. I say loomed, because 4,000 feet might not sound like a lot, but when it rises from sea level the way it does, it is big. 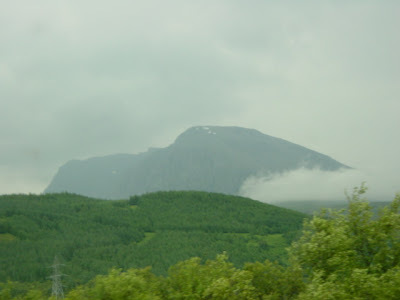 I took a lot of lousy pictures through the bus windows because we couldn't stop at all these incredible sights. The thing is, if your vacation has to be timed this way, you miss out on a heck of a lot of really interesting things. 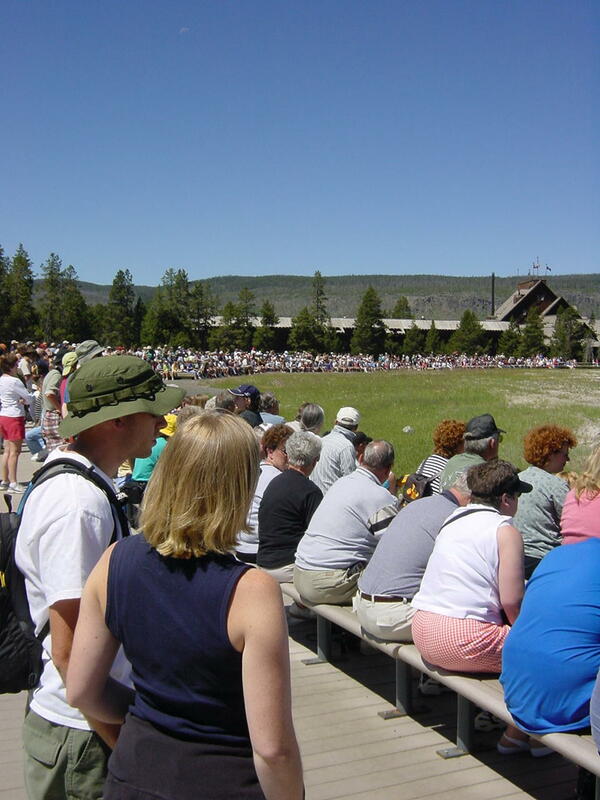 Get out and walk through the Upper Geyser Basin, be patient, and you might see some really extraordinary things that don't involve Old Faithful and giant crowds. 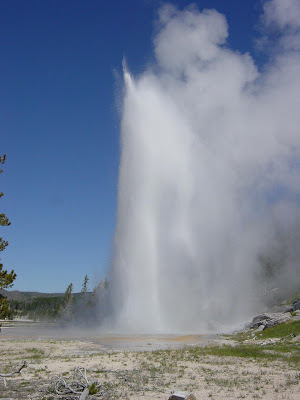 On my last visit I got to see two major geysers, Castle and Beehive, going off at the same moment. And no crowds. Yeah, I'll probably get dinged for this one, too, but really. 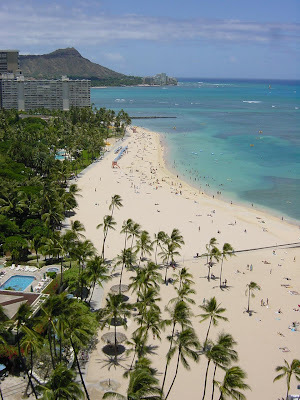 I personally find Oahu to be the least interesting of the four Hawaiian Islands that I've visited, and Waikiki is the 'leastest' interesting of all. Mind you, all things are relative, and if you told me I could go to Waikiki and go nowhere else, I, eh, would take you up on the offer without hesitation. In spades. But consider that as the epicenter of tourism in Hawaii, this is the most crowded spot you can imagine, and just about everyone you see is willing to help part you from your hard-earned money. If you go to Hawaii, rent a car (or borrow one from your in-laws. I have connections! ), and get on the road around the island. Quiet beautiful beaches and interesting geology can be found all over the place. Even better, get to one of the other islands. Hawaii is one of the closest places to paradise that I have ever been. But Waikiki...not my cup of tea. The Baptistry leans almost as much as the tower does...and in all fairness, the interior of the Cathedral at Pisa was beautiful. That's it for today...I welcome your tirades and ideas for part 2! Serpentine is not asbestos, exactly. Well, it is, but only sometimes. Serpentine is one of several minerals that includes an asbestiform crystal form, the finely spaced fibrous threads that turned out to be a great fire retardant. The thing is, of course, certain forms of asbestos cause mesothelioma and other diseases. But the most dangerous forms do not necessarily include chrysotile asbestos, the form derived from serpentine. The most dangerous stuff comes from the amphibole crocidolite. It is dangerous, but serpentine as a learning tool is something all together different. 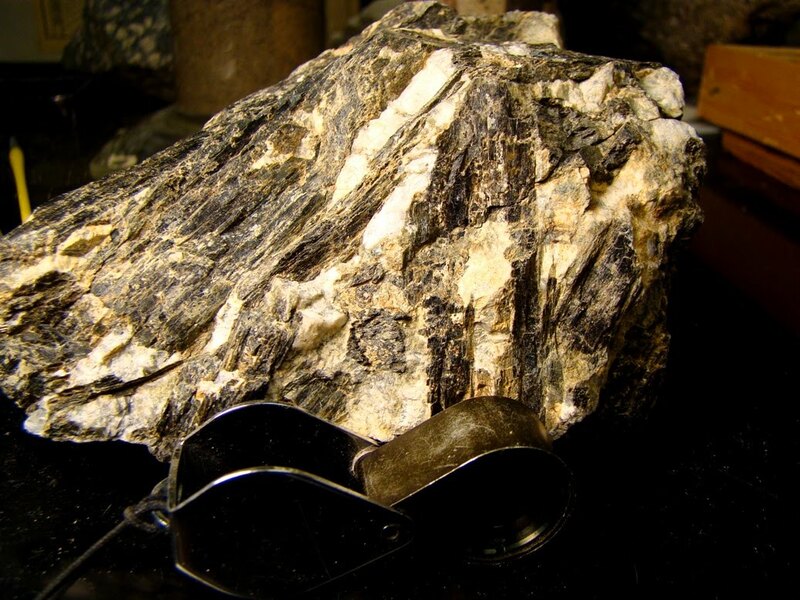 At the same time that gold was selected as the state mineral, serpentine was designated the state rock. 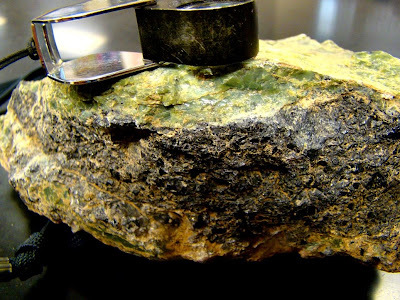 Serpentine (more properly called serpentinite) is a metamorphic rock derived primarily by the alteration of peridotite (a rock from deep in the earth's mantle composed of the gemstone peridot, also known as olivine). Chemically it is a magnesium silicate. It is a relatively common rock in California and relatively rare in most other places, and was picked for an ironic reason: it is a source of asbestos, which at the time was considered a valuable resource. The dangers of asbestos in building construction was not generally realized at the time. For different reasons, I think serpentine was an excellent choice for our state rock. 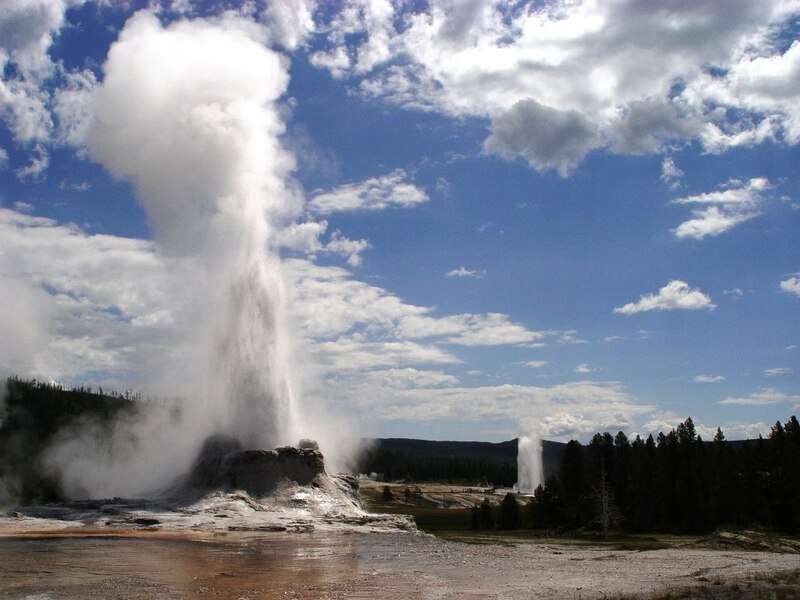 The fact that the source of the rock is deep in the earth's mantle, beneath the 15-25 mile thick crust, is a revelation and acknowledgement of the incredible forces that have shaped the state. Imagine what it takes to bring masses of rock from such great depths! California has the incredible scenery that it does because of forces of movements along plate boundaries, whether the lateral movements along the San Andreas fault, the vertical churning that occurs along convergent boundaries, where ocean crust is driven underneath the edge of the continent, or the splitting that occurs at the divergent boundary in the far south of the state. 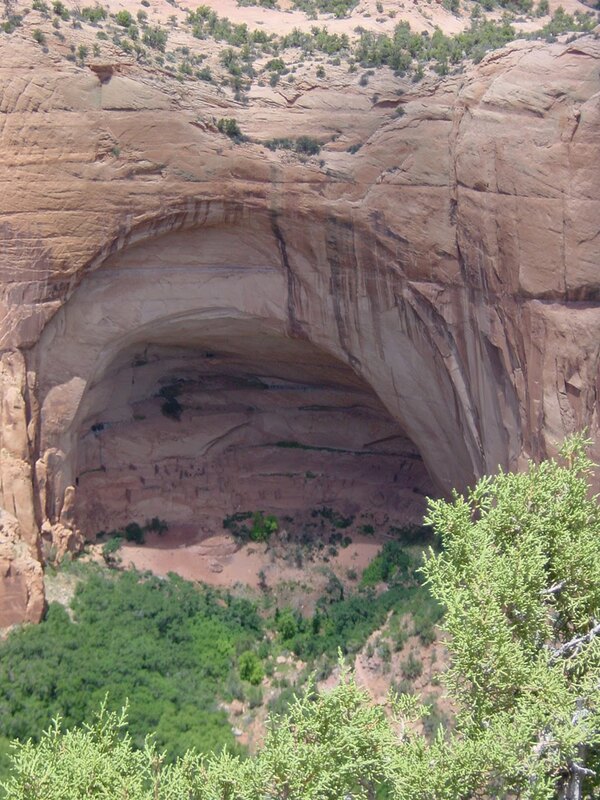 The rock is also quite pretty, to this geologist's eye. It ranges in color from black to intense jade-green. The journey from deep in the crust to the surface along fault zones usually leaves beautiful polished surfaces on the rock. Oh, that's right, it's epidemics we're supposed to worry about. 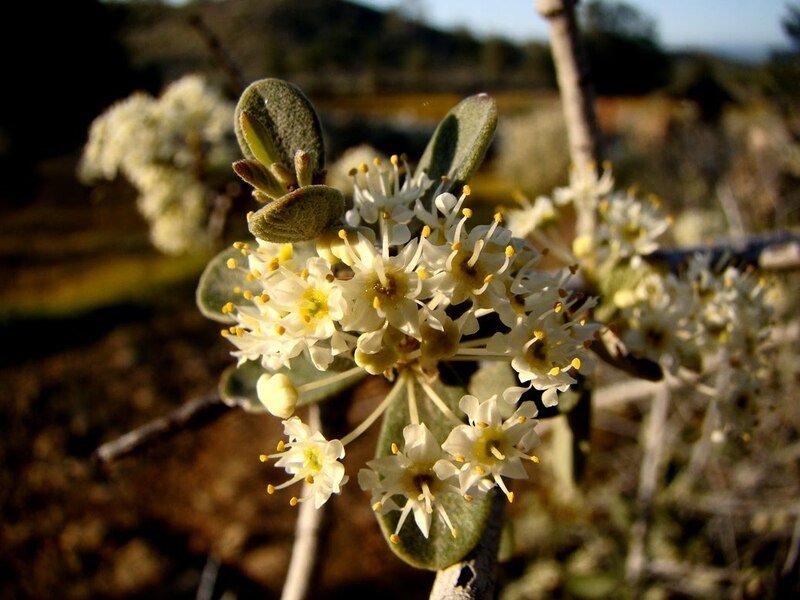 An endemic refers to plant species found in specific limited locations. There are a number of these in the Red Hills "Area of Critical Environmental Concern", a rather high-falutin' name for an area that less than two decades ago was barely more than an open garbage dump scarred by numerous off-road vehicle trails. 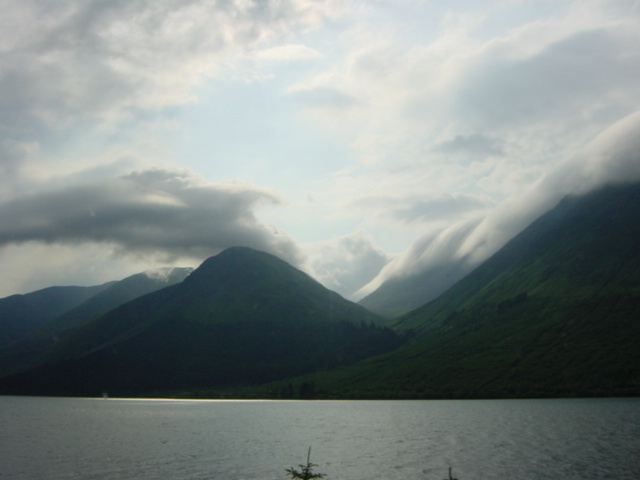 The rare and endemic species are there for a very geologic reason, the subject of this post. 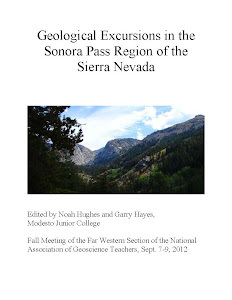 ...I've been following a regional theme, traveling through the northernmost provinces, but the Other California has a temporal pattern as well, and late March is the perfect time to talk about the Red Hills, located in the Sierra Nevada Mother Lode near the Gold Rush town of Chinese Camp (I talked about the area around La Grange a few days ago for the same reason). 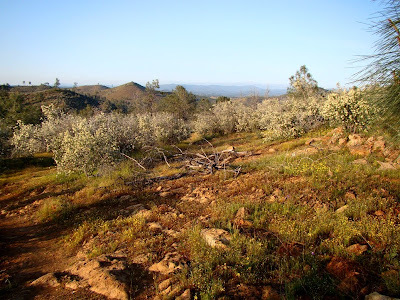 Much of lowland California is currently covered with a green carpet of grass (mostly of exotic and invasive origin) along with the occasional oak tree, but as you can see in the pictures above, there are a few places where the grass and oak trees are missing, and a profusion of flowers and scattered pines thrive instead. Why are the oaks and grass missing? The Mother Lode is famous as the source of the ores during the Gold Rush in 1848-53, and many people know of the association of quartz veins with the gold. What is perhaps less known is that the Mother Lode consists mostly of metamorphic rocks like slate, greenstone, and marble, not the granite that is found in the higher parts of the Sierra Nevada. 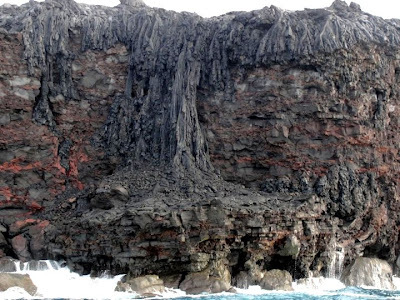 These metamorphic rocks are the twisted and baked remains of sea floor muds and silts, lime from tropical reefs and shelves, and volcanic rock from the oceanic crust. These collections of crustal rocks (called "exotic terranes") were transported across the Pacific Ocean and slammed (in the geologic sense; they moved at maybe 2 inches a year) into the western edge of the North American continent, mostly in the late Paleozoic and Mesozoic eras (the Mesozoic, from around 251 to 65 million years ago, is best known as the "age of the dinosaurs"). The different terranes are separated from one another by major fault systems. At times the crustal terranes also include rocks from beneath the crust. 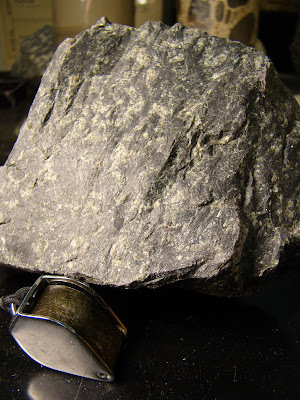 This rock hails from the underworld of the earth's mantle, and includes dunite and peridotite, composed primarily of the mineral olivine (known to most people as the gemstone peridot). The rock readily alters to serpentine, California's state rock. These rocks are also collectively called ultramafic rocks, for their high content of magnesium and iron (fe, the 'fi' part). They also contain small, but significant amounts of nickel and chrome. 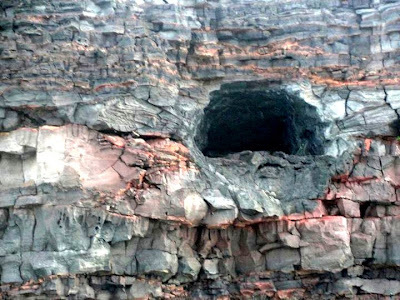 When ultramafic rocks are brought to the surface, they are far out of chemical equilibrium with the ambient conditions, which means they are easily attacked by oxygen, water and organic acids. Clay is a common product of this process, as well as red or yellow iron oxides (from which the Red Hills take their name). The surface layer resulting from this weathering process is of course soil. We tend to think of soil as a rich surface layer that supports plant life, but some soils lack the necessary nutrients for most kinds of plant growth. This is definitely the case for soils developed on ultramafic rocks, which lack nitrates, phosphorus, and potassium. To make things worse, chrome and nickel are actually toxins. Hence, only specialized species can thrive on these rocks. The shrubby Ceanothus, or Buckbrush (above) and Gray Pine (below) are two plants that are more or less indifferent to the odd soil conditions. They grow elsewhere, but compete very well in ultramafic soils. 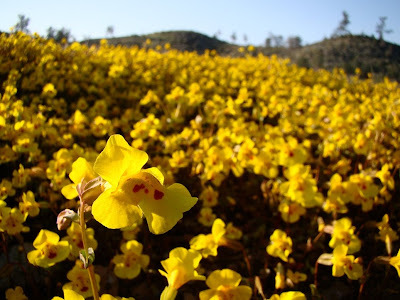 A large number of flower species are also indifferent to the soils, but the only grasses found in the region are native species. 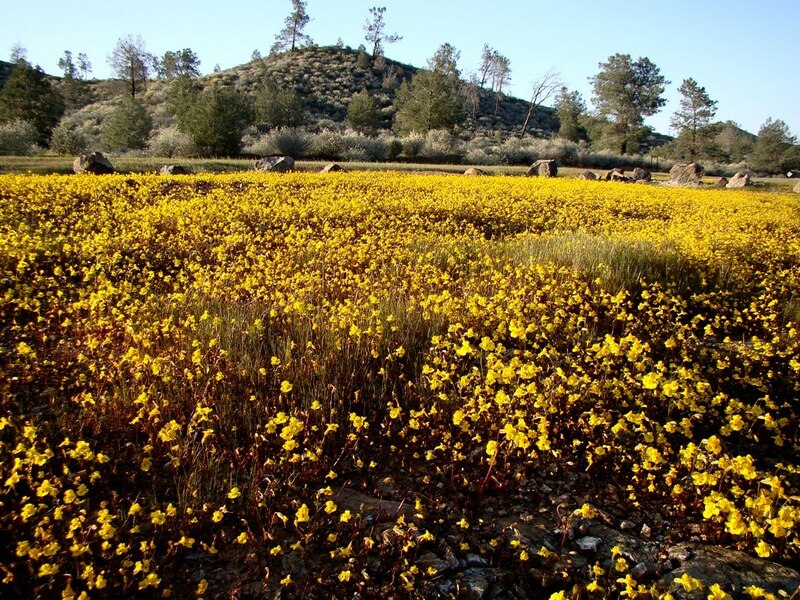 The European and Asian grass species that have overwhelmed most of the prairies in the Central Valley, Coast Ranges and Sierra foothills cannot grow on the serpentine soils. There are a number of endemic species that grow on these soils, and at least one is found nowhere else in the world (California verbena, Verbena californica). 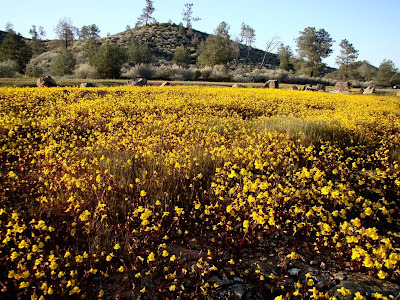 Other rare endemics include Rawhide Hill onion (Allium tuolumnense), Layne's butterweed (Senecio layneae), Congdon's lomatium (Lomatium congdonii) and the Red Hills soaproot (Chlorogalum grandiflorum). A fairly common serpentine endemic is the Milkwort Jewelflower (Streptanthus polygaloides). Alas, I arrived very late in the afternoon and had no time to search them out (and to be truthful, I am better at identifying rocks and minerals). Though closely associated with the rocks of the Mother Lode, the serpentine and dunite were remarkably free of gold, and so the Red Hills were mostly ignored by the miners. Farmers couldn't grow much in the soils, and grazing conditions were not favorable, so the when the federal government came into possession of these lands in 1848, they couldn't even give them away! So this swath of land, about 7,000 acres worth, was administered, somewhat indifferently, by the Bureau of Land Management. The landscape suffered the abuses of modern civilization, with trash heaps, motorcycle trails, and unrestrained target shooting. 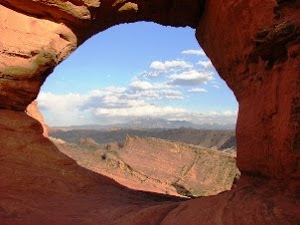 The recognition that the area was a unique geologic and biologic treasure led to the restriction of shooting and off-road vehicle use in 1991. Private groups assisted in cleaning up the trash heaps and a trail network was established, so today the Red Hills are a delightful place to visit, especially in the spring when the wildflowers are at their stunning best. And I could be wrong, but I don't think I've seen any postcards with pictures of the area. How many of you tried to dig a tunnel to China in the backyard when you were a kid? Given the soil conditions in the yard I grew up in, I'm probably lucky to be alive. I dug tunnels looking for buried treasures, gemstones, fossils and sometimes I was just curious what was down there. Geologists, I've found, are the kids who tried to find all those things, and never really grew up. So how far do these overgrown kids get? It turns out that the deepest tunnels that humans have ever been able to dig reach depths of about 12,800 feet, a little over 2-1/2 miles. That might seem like a lot from our point of view, but the depth to the center of the Earth is around 4,000 miles. We've barely scratched the surface, yet the temperatures of the rock at these depths is well over 100 degrees, and the rocks are under so much pressure that explosions of rocks from the walls are a constant danger to the miners. Kids, there's got to be a better way to see what lies deep below. And there is, in the Other California, one of those places not found on the postcards. The adventure lies in the Klamath Mountains, and the most dangerous thing you have to face is slipping on a slick river rock, because geological processes have brought the rocks many miles up from the depths. 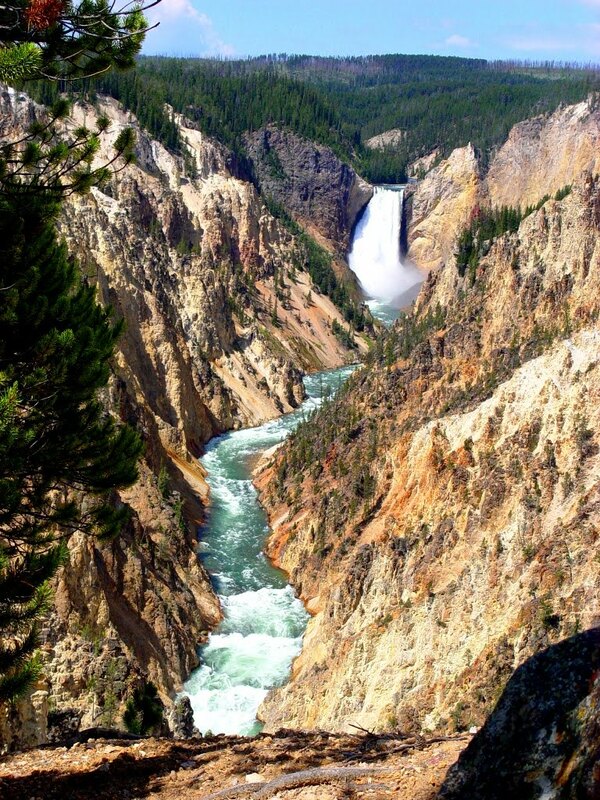 You need only explore the rivers flowing off the mountains to see what the deep interior of the earth looks like. 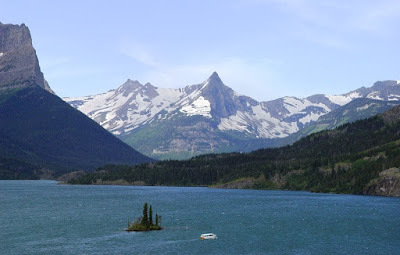 The Klamath Mountains are a collection of bits and pieces of the earth's crust that have been carried great distances from their point of origin and slammed (at geologic speeds of inches per year) into the western edge of the North American continent. 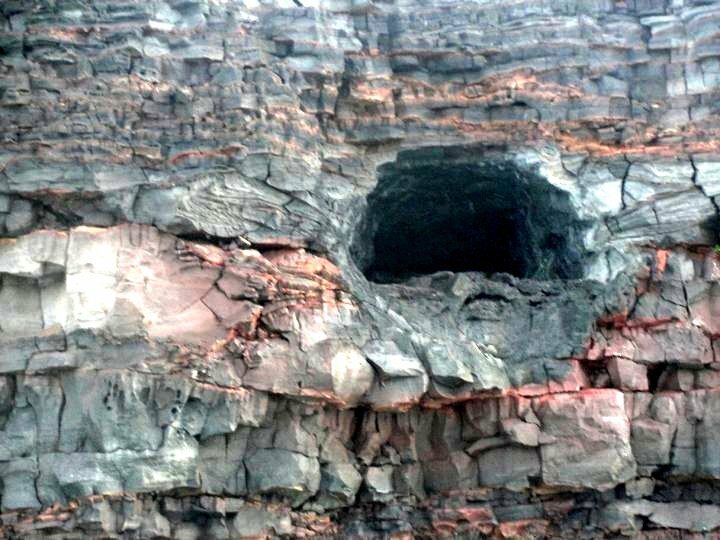 A huge variety of igneous and metamorphic rocks are found around the province, and some of the most interesting are those that once resided deep in the Earth's mantle, a layer that extends from just below the crust, from maybe 15 or 20 miles beneath our feet, to a depth of about 1,800 miles. Here are a couple of bits of the Earth's deep hidden places that I found on a short trip to the Eastern Klamath Terrane in the vicinity of Gazelle. The oceanic crust is usually described as being made of basalt, but a few miles down in the crust the basaltic magma cools slowly to form a coarse-grained basaltic rock called gabbro. Sometimes, as can be seen above, the crystals that form are huge, with black hornblende and white feldspar crystals several inches long. Igneous rocks with such large crystals are called pegmatites. Going even "deeper" into the interior, we pass the Mohorovicic Discontinuity, the dividing line between the crust and mantle. The upper part of the mantle is composed of olivine-rich rocks like dunite or peridotite. Olivine is best known to most people as the green gemstone peridot. That's right, much of the Earth's interior is made up of gems! The rock in the picture above is dunite, in part slightly altered to serpentine. In many parts of the Klamath Mountains, the mantle rocks are completely altered to serpentine, the state rock of California. These ultramafic rocks are fairly rich in a number of unusual metal ores, including platinum, nickel, magnesium and mercury. One of the most important ores is chromite, which is the only significant source we have for chromium, the metal that puts the "stainless" in stainless steel. 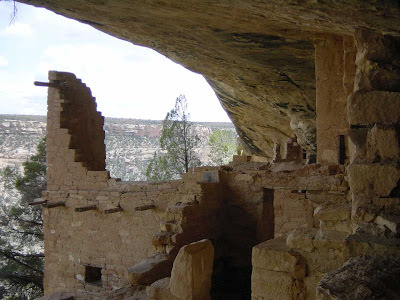 We import most of the chromium that we need from foreign sources, but in wartime (especially the two World Wars), the ores were mined domestically, and a number of operations were present in the Klamaths. The black semi-metallic crystals in the picture above are chromite, with green serpentine across the top. 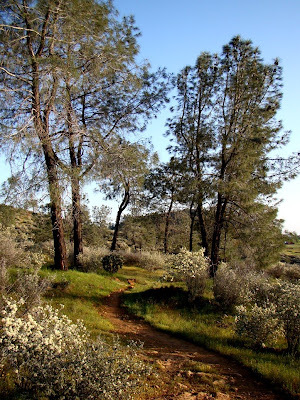 The bill was introduced by Sen. Gloria Romero, a Los Angeles Democrat, and the California Assembly Natural Resources Committee approved the legislation, stripping serpentine of its official designation, and sent the bill to the Assembly floor for consideration. An earlier version of Romero’s bill previously passed the California Senate. This picture is making the rounds today. It's appalling. It's easy to blame oil companies for the nefarious happenings in the Gulf of Mexico, or lax government regulation, or complacent attitudes over safety, but ultimately, the blame lies with ourselves. A number of commentators in recent days have pointed out that every president since Richard Nixon have described the need for "energy independence", but as for taking real action, well, the only guy who tried to actually say we had to make hard choices got canned in favor of the happy-go-lucky grandfathery "morning in America" fellow in 1980. Meanwhile, ever since the 1970's, we've continued wasting petroleum and almost totally ignored the problem. Even now, hardly anyone in the media or in the broader culture seems to be discussing the bigger problem. It's not seeping into the national conciousness the way it is into the gulf. It's not just the mess we made in the Gulf. It's the problem of the oil we burn. We are addicted to petroleum; we are doing nothing to curb that addiction, we are just working harder and paying more to feed our addiction. But the oil is running out, and we have no viable alternatives. We are poisoning ourselves, and overheating our atmosphere, but we will tolerate no talk of ...dare I say it?...sacrificing. Instead, we will just drift along until we hit a very tragic wall. 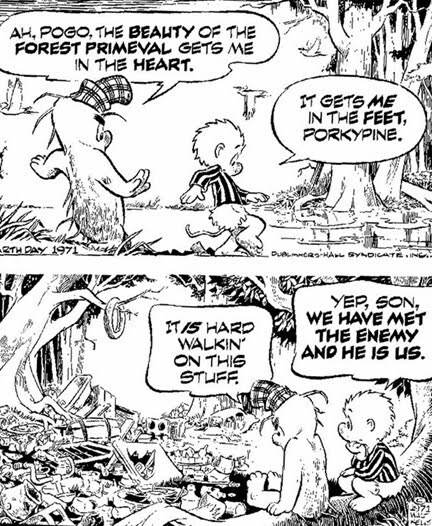 Then the sacrifice will be on us whether we like it or not. Gas at $20/gallon? Not so far away. No gas at all, like the 1970's? Probably. Contrary to the myth, you can't see the Great Wall of China from space. Check out the larger version of the picture above...maybe you are sharper-eyed than I am, but how sad that the one bit of evidence that we live on this planet that is visible from space is an oil slick. 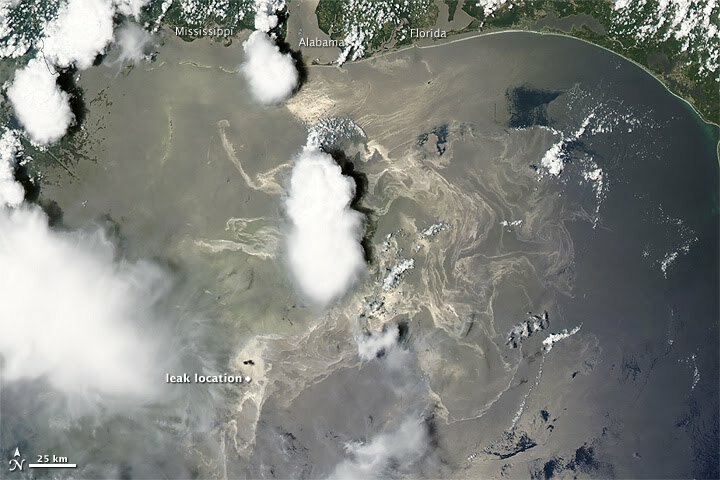 The oil spilled in the gulf may amount to 2 million barrels so far (over the two months)...that's about one-tenth of what we consume as a country per day. I..er..uh, I have more to say, but I think American Idol is on. See ya'. Satellite Imagery from NASA, full image is here (10 mb). 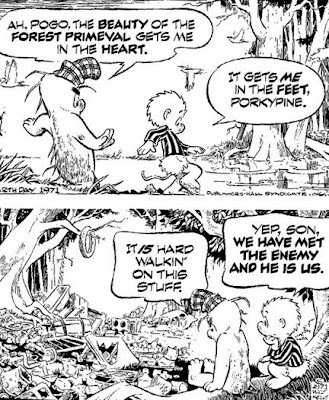 Learn about Pogo and the 1971 Earth Day Poster with the famous line "he is us" here. 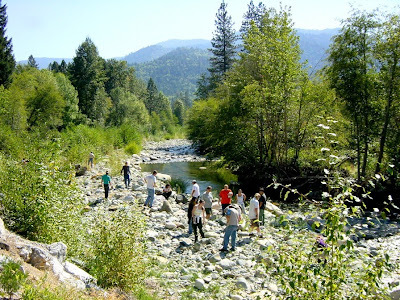 In January of 1997, the Tuolumne River basin experienced a disaster. Two factors, each astounding in themselves, converged to produce an unprecedented event, a 200-300 year flood. 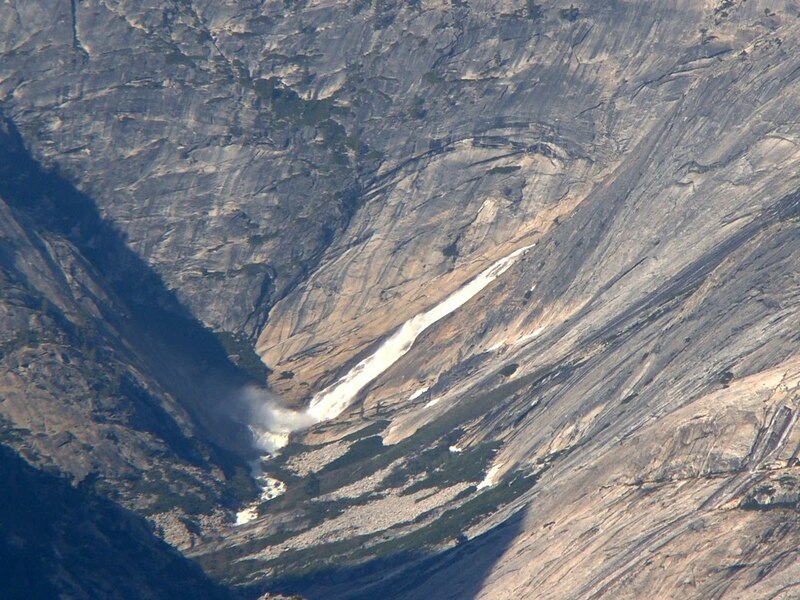 After a record-breaking December, a huge snowpack had built up in the Sierra Nevada watershed at Yosemite National Park. Then a very warm "Pineapple Express", a tropical storm coming off the Pacific Ocean, arrived from the southwest. Rain was falling at 10,000 feet...in January. And it was a LOT of rain, as much as three feet in places. The snowpack quickly melted, and vast amounts of water were headed downstream. Downstream, in Modesto, the Tuolumne River officially reaches flood stage at around 9,000 cubic feet per second. 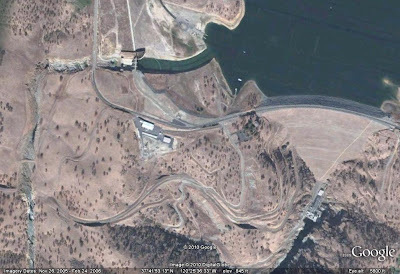 Upstream, something like 130,000-140,000 cubic feet per second was flowing into Don Pedro Reservoir, the primary flood control facility on the river. Although the dam was apparently at the proper level for normal year flood events, this event was magnitudes beyond anything they were prepared for. The lake, with 2 million acre-feet of storage, whose variations might be measured in inches per day, started rising a foot per hour. 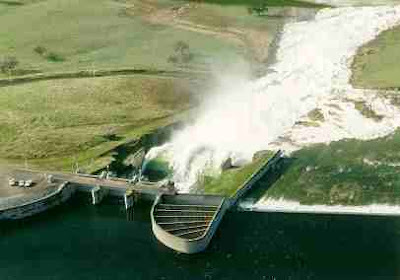 They had all of 18 feet of freeboard before the dam would be overtop and start flowing uncontrollably. The decision was made to open, for the first time, the emergency flood gates. A giant river was about to be unleashed on a meadowland that had never before had a river flowing through it. Over the next few days, a new canyon appeared. 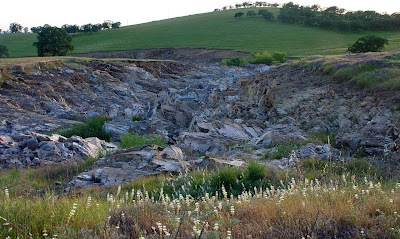 The overlying soil was quickly washed away, and the rapidly moving water quarried out jointed blocks of metamorphic rock and carried them away as well. The resulting channel can be seen in the pictures above. It is forty feet deep in places. In Modesto, 185 homes were flooded, several bridges were damaged or washed out. The discharge in town was about 70,000 cubic feet per second. It is scary to think of what could have happened if there had been no flood control on the river. I bring this up today because of a strikingly similar event that took place in Texas in 2002, and was discussed by Brian over at Clastic Detritus. 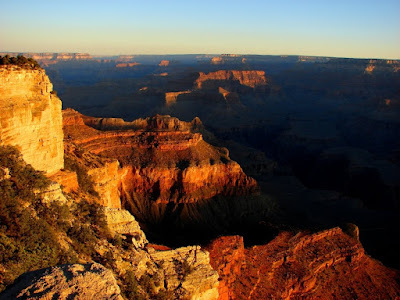 Brian comments on how events like these inform us of one of fundamental principles of geology, uniformitarianism, and how the principle is so often misrepresented by young-earth creationists. 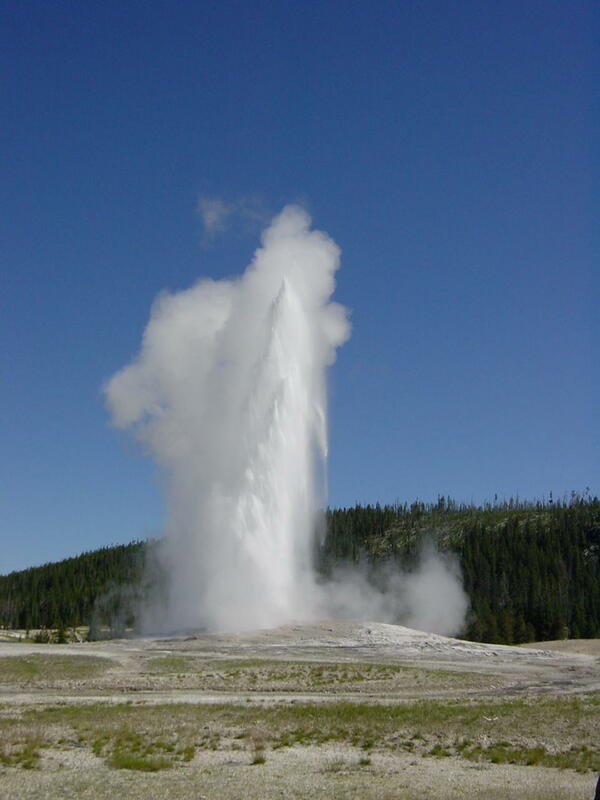 4.5 Billion Years of Wonder also chimes in with an excellent discussion about the Texas event, and some warnings about how the findings will be misused. It is so easy for researchers to have their work misrepresented. These posts are well worth your time! 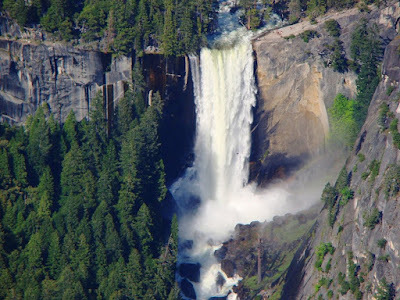 Here, we are looking towards the headwaters of the Merced River, and this shot shows the famous plunge of the river over Vernal Fall (317 feet) and Nevada Fall (594 feet), along with the dome of Liberty Cap (center), and Half Dome on the left. From this perspective, one can see that Half Dome would better be called Two-Thirds Dome (I prefer the Native American name of Tis-sa-ack). 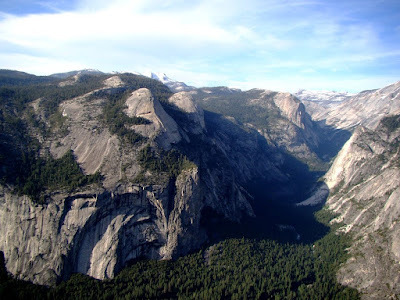 During the height of the ice ages, ice covered almost all the scene before us, except for the topmost part of Half Dome and the higher peaks in the far distance. As the ice flowed, it dropped over jointed sections of bedrock, and plucked the rocks in such a way as to form a series of stairsteps. 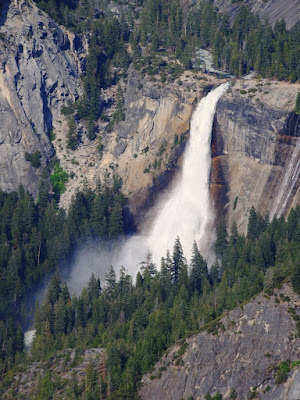 These steps became the setting for two of the most spectacular waterfalls in Yosemite National Park. 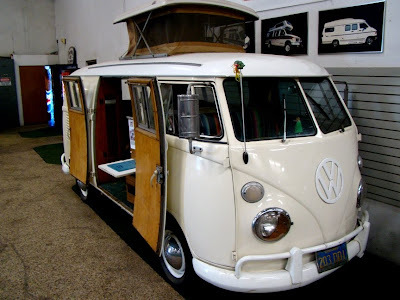 A month ago I was asking for some ideas about a possible mobile field laboratory for our geology field studies program, and through various avenues I received some really great suggestions. 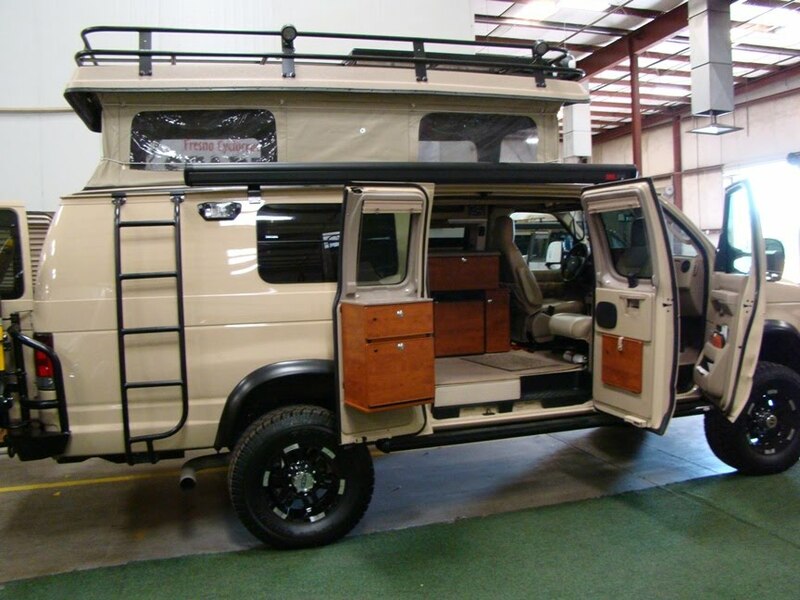 Well, a month has passed and I've been doing lots of thinking and planning, and today I took a road trip to see the factory where custom vans are constructed. It was a fascinating visit, and I got to see a number of different configurations. At the last moment, we walked past the van that would be the ultimate field lab....such innovation! It was a specialized import from Europe, a no-nonsense vehicle with such a compact modern hi-tech engine that it can be barely be located in the vehicle: it dispenses with a water-based radiator system (with all that poisonous ethylene glycol), and uses simple air instead for cooling. The small engine makes for lots of luggage space in the vehicle. The simple box-like construction allows a flat surface for the installation of solar cells. And the gas mileage! In the mid 20's mpg, almost twice what the other vans get. Okay, I'm kidding. 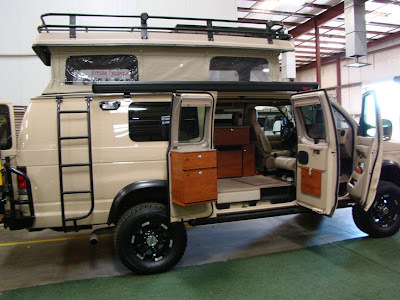 But I did see a vehicle that made me drool a bit: 4x4 van with lots of great storage in back and on top, a canopy, an external tool box, and it just plain looked cool. The planning and designing continues...thanks to everyone for your suggestions! Today's photographic tour comes courtesy of my nephew Jacob, who worked hard the last few years to save enough for a tour of the Hawaiian Islands. One of his adventures was a boat tour off the coast of the Big Island where the Pu'u O'o flow has been pouring into the Pacific for much of the last quarter century. A boat tour this close to the fresh lava flows is something I haven't had the opportunity to do yet. The lava is erupting from the East Rift Zone of Kilauea, and flows for six or seven miles through a system of lava tubes until it reaches the coast. One of the lava tubes (in the picture above) has been breached by wave erosion. The lava flows are still extremely hot, even after traveling for miles (the lava tubes are an excellent insulating environment). 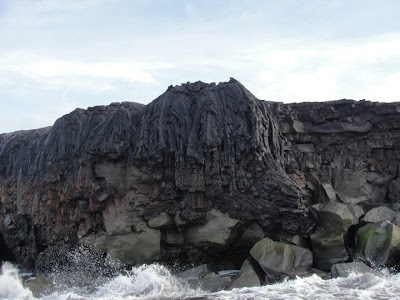 As they emerge from the tubes, they flow like thick syrup, forming so-called pahoehoe lavas. Here, another lava flow spilled over the edge of a seacliff. It didn't take the waves long to cut into the base of the flow. Looking at the cliff exposure, it is easy to see why very few streams can be found on this part of the Big Island. Any rain immediately seeps into the subsurface through the system of cooling fractures. 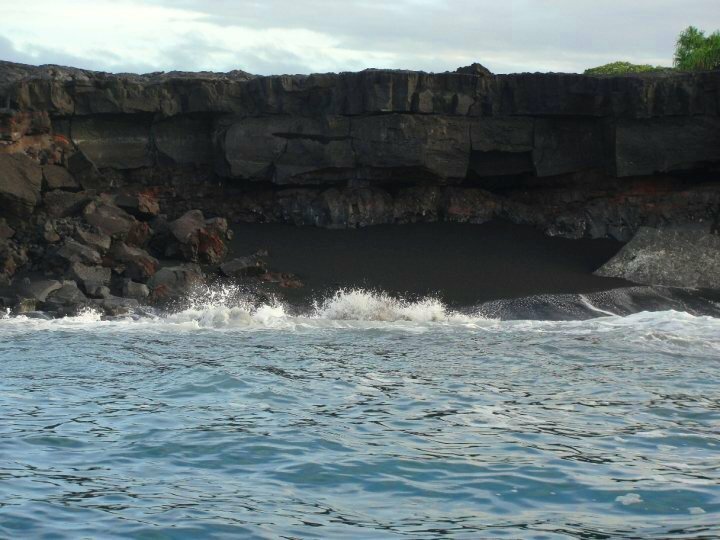 At times, the lava flows directly into the water and shatters on contact, forming black sand beaches (above). Hawaii is unique in the variety of sandy beaches; some are composed of coral fragments and are white, some are reddish, from weathered iron-rich basalt, some are black, and a precious few beaches are composed of bits of olivine, and are green. 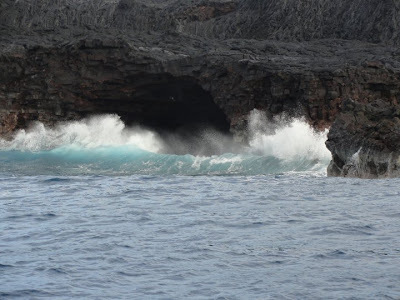 Wave action can quickly enlarge openings, forming sea caves. Arches are also produced by the waves, but they don't tend to last for very long. Jake, you have the makings of a real geologist! Thanks for sharing these great photographs! In the interest of full disclosure, I don't really have a wooly mammoth in my department. I do have a sabertooth cat, though. 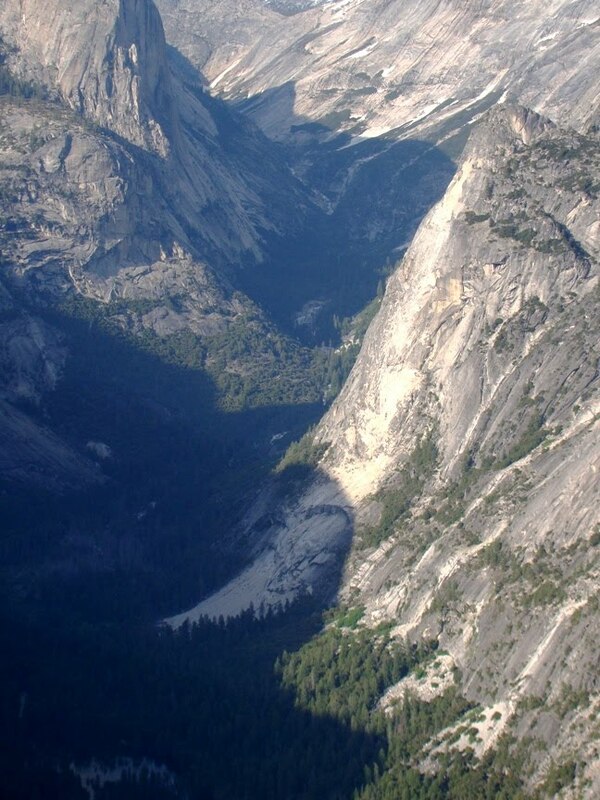 Half Dome is down to a Quarter! 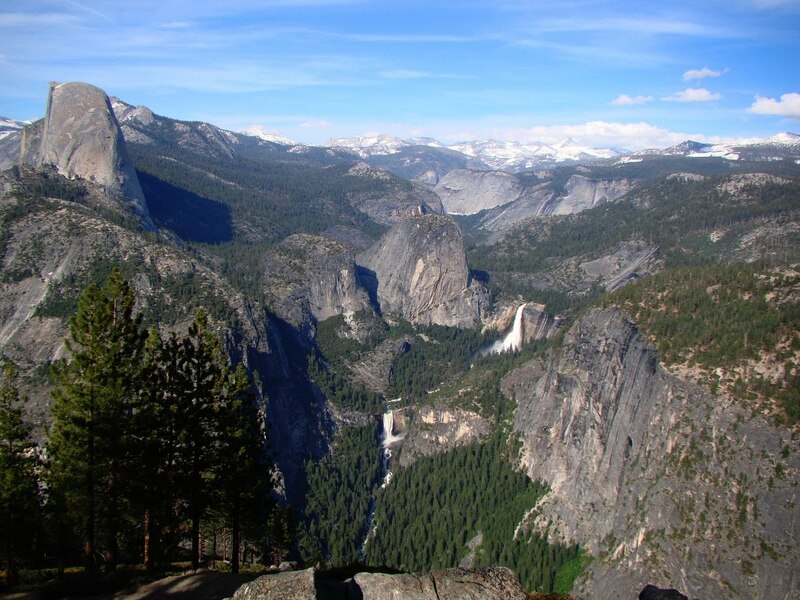 Will Anyone Want to Visit Yosemite? OK, not really, I'm just continuing a brief series on Yosemite Valley encouraging folks to look behind and to the side of the iconic features like Half Dome, El Capitan, Yosemite Falls and Bridalveil Fall. 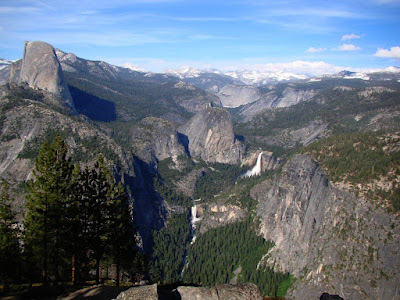 Our "high-water journey" to Yosemite Valley last week included an excursion to Glacier Point, which had opened to visitors only a few days prior. 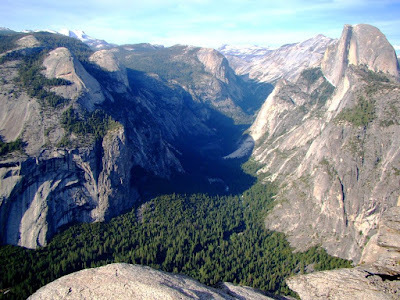 The views from Glacier Point, and the usually quieter Washburn Point, were spectacular, as they almost always are. Half Dome dominates the views, so I was trying to take a few shots that didn't have the granite monolith in the center. They appear below. I am always struck by the grandeur of Tenaya Canyon, the main tributary valley to the Merced River that meets the Merced at the head of Yosemite Valley. I call it a tributary "valley" because Tenaya Creek is a relatively underfit stream, quite incapable of carving such a deep valley, one that rivals the Grand Canyon in depth. Even the glaciers shouldn't have been big enough to carve such an impressive gorge, and they wouldn't have except that the vast ice sheet that covered the Tuolumne Meadows area to the north spilled over and contributed a vast amount of ice to the otherwise small Tenaya glacier system. It was a week of the highest snow runoff, with the Merced River running at 7,000 cubic feet per second, about three times normal. So with a zoom shot, I was able to spy the rarely viewed Pywiack Cascades, in a trailless and inaccessible part of Tenaya Creek Canyon (an interesting description of the high adventure journey through this gorge can be found here). I would love to make that journey, but I'm getting just a bit old for such ventures! 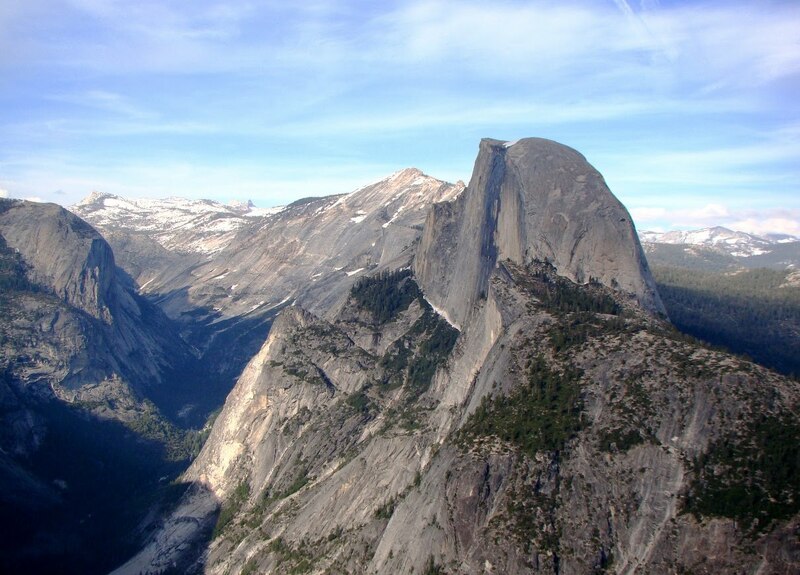 If Half Dome didn't exist, North Dome and Basket Dome would certainly command more attention. Unlike Half Dome, these lower domes were probably covered by ice during the most intense glaciations, but in the last 800,000 years most of the shaping has been accomplished by exfoliation. Exfoliation is a form of unloading, in which the granite expands as it is exposed by erosion, cracking into slabs running parallel to the surface of the rock. The slabbing tends to break off corners and edges, leading to the characteristic dome shape. The view from Glacier Point changed forever in March of 2009 when a huge rockfall, the biggest in two decades, thundered off of Ahwiyah Point below the cliffs of Half Dome. The light colored strip running across the photo above shows the path of the slab, and the pile of talus in the shadow shows the impact point. Hundreds of trees were blown down, and a popular hiking trail was covered, but luckily no one was hurt. 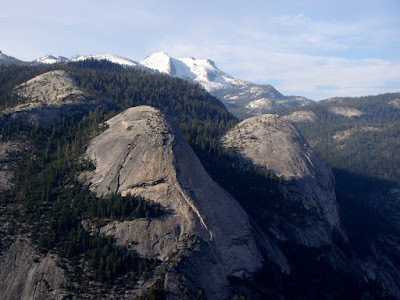 I know it is hard to see the view from Glacier and Washburn without actually noticing Half Dome, and so I did take quite a few pictures of it. One of them is below, if you are feeling only half-satisfied by the rest of the post! Lockwood started it and I've seen it on numerous sites now. I can't resist peer pressure, so I must also participate in the meme. Says Lockwood: Bold the ones you have visited, and italicize the ones you’ve never heard of before. 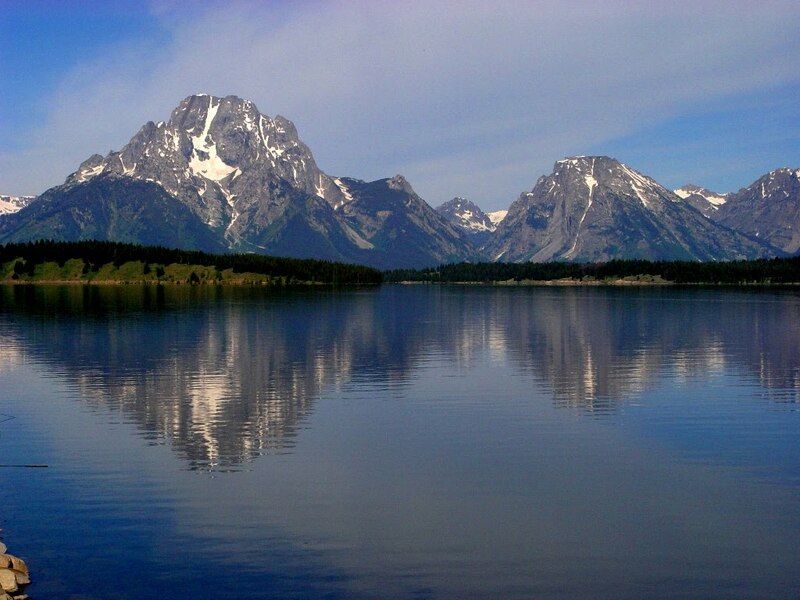 8: Grand Teton - Easy to get to if you visit Yellowstone, and more spectacular vistas, especially if you hike into the mountains, above the valley floor. 4: Yellowstone – Weird and strange, and deserving of being the first national park. Lots more to it than Old Faithful, though. Quite a few geysers are bigger, and of course all the geothermal features are sitting on one of the biggest calderas on the planet (I refuse to call it a supervolcano). I'm noticing that very few of the memists so far have been to many of the parks on the "least visited" list. If you have, I hope you will participate and include pictures! A Picture Cries Out For A Caption: Can you help? What Numbers Do You Find Irresistible? New Accretionary Wedge (#25) is Up!